Anna Sabatova was born in Brno. Her father, Jaroslav Sabatov, was a left-wing opposition leader and in 1978 a spokesman for Charter ’77. 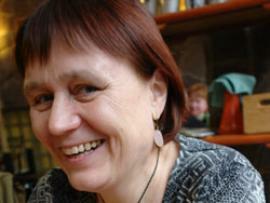 After completing high school in 1969, Anna started a degree in Philosophy at Brno University. Before the 1971 elections she was arrested along with her father and brothers for distributing leaflets against the Government’s methods of forcing people to vote; the leaflets stated that the vote is a right, not an obligation. Sentenced to three years for “subversive activities”, her sentence was suspended in December 1973. The following year she married the journalist Petr Uhl, co-founder of Charter ’77 and of VONS, and she moved to Prague. From 1977 to 1979 she worked with the left-wing parties of West Berlin, arranged for numerous Czech samizdat papers to be distributed in the West and introduced foreign writings into Czechoslovakia. She signed the Charter ’77 declaration and took an active part in the movement. In 1978 she was among the founders of the Committee for the Defence of the Unjustly Persecuted (VONS). After her husband’s arrest and up until his release, from 1979 to 1984, Anna continued to publish the newsletter “Information about Charter ‘77” that he had founded. Her flat became a privileged venue for meetings between dissidents and was repeatedly searched by the secret police. Thanks to her work for Charter ’77 and the VONS, Anna Sabatova soon became one of the most admired figures in the Czechoslovak Human Rights movement; she frequently attended trials against dissidents and was consequently stopped and interrogated on several occasions. In 1984, after almost ten years’ bringing up her children, she got a job, first as a stoker in a hotel and then washing dishes. From 1986 to 1987 she was a spokesperson for Charter ’77 along with Martin Paolus and Jan Stern. In 1987 she was a founder member of the Polish-Czechoslovak Solidarnosc and a year later became its spokesperson, along with Jan Carnogursky and Petr Pospichal. In 1988, with Pospichal, Uhl and Jan Urban, she founded the East Europe Information Agency, which aimed to create links between the opposition movements in Central East Europe and provide information to foreign media. In November 1989 she was head of the Velvet Revolution’s press office. In 1990 she resumed her studies at Prague’s Charles University, where she graduated in Czech Philology in 1996. From 1990 to 2002 she acted as a consultant for the Ministry of Labour, and dealt actively with social issues. In 1988 she received the UN Human Rights award, set up on the occasion of the United Nations’ 50th anniversary. From 2001 to 2006 she was the spokesperson for Citizens’ Rights in the Czech Republic.